Holi announces the passing of winter and arrival of spring, radiating merriment. People meet each other with warm embraces, burying hatchets, and throwing away their worries. During Holi, every corner presents a colorful sight filled with singing, dancing, delicious foods and desserts, and quality time spent with friends and family. This Festival of Color in spring is nature’s way of singing “Holi Hai!”. 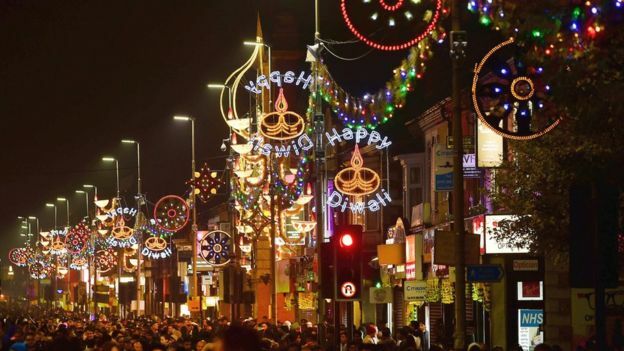 From grandparents missing the festivities back home, NRI’s introducing their young children to the festivities, or an American-Indian bringing their Non-Indian co-workers to a holi event, this is one holiday that is enjoyed by all age groups. Over the years, the Holi festival has been mainstreamed and has become a welcoming space for all faiths. This Festival of Colors is often attended and enjoyed by many, including Muslims, Sikh, Mormons, Catholics, and Jews. Over the last few decades, the Indian population in the U.S. has grown drastically in metropolitan cities like New York, Chicago, San Francisco, San Jose, and D.C. When it comes to Hindu holidays like Diwali, Lohri, or Holi, Indian associations and festival organizers plan colorful, fun-filled events of Indian street food, singing, and choreographed dancing. Upcoming Holi Celebrations Across the U.S. These upcoming Holi celebrations also incorporate Holi rituals including the burning of wood or lighting of a bonfire called Holika. This is followed by the actual play of colors where people wear white outfits, and take delight in spraying colored water on each other or throwing handfuls of holi color on one another. As always, the foodie in me is wondering what delicacies will be served during this colorful festival. The must have beverages include, thandai, made with saffron, almonds, sugar, milk and a variety of herbs, and lassi, a yogurt based drink. Some savory snacks include papri chaat, dahi vaada, and kachori. Papri chaat is made with crispy dough wafers served with chickpeas and boiled potatoes, tamarind chutney and yogurt. Dahi Vaada is prepared by soaking fitters made from lentil, chickpea flour, or potato immersed in yogurt (dahi), topped with cilantro, chili powder, crushed black pepper, chaat masala, cumin, green chilis, or boondi. And lastly, kachoris are lentil-filled pooris or dumplings served with tamarind chutney. To top it off, desserts for the Holi festival include, Gujiya or stuffed dumplings, Malpua- a sweet crepe prepared with a batter of coconut, crushed banana, flour, milk, and cardamom, served with a sugar syrup- and Kesari Malai Peda. Kesari Malai Peda are balls made with cream (malai) or thickened milk, saffron, and cardamom. Extraordinarily different, a feast of foods, sounds, and colors, there’s nothing quite like India, and there is no better way to experience Indian culture in the United States than to celebrate the Holi festival with the locals. That said, don’t pass up this opportunity of participating in one of the world’s most vibrant festivals and singing “Holi Hai!” no matter where you are. Best Indian Hors d'oeuvres for your Next Holiday Party! We are in full swing for the Holiday season! Although holiday times are fun for some, they can be a daunting time for others with end of the year work deadlines, finding budget friendly presents, or even preparing to throw the ultimate holiday cocktail party. To make life a little easier for you, we have come up with three unique Hors d'oeuvre recipes which will take only minutes to prepare and will leave the attendees talking about it for days. Goodbye Tequila Shots, Hello Pani Puri Shots! 1. First, put a few tablespoons of oil in a fryer and let it heat. 2. Next, place them in a single layer in the fryer for 2 minutes until golden and crispy. Let it cool for 1 minute. 3. Then, gently puncture each of the fried puris with a small knife to create a hole large enough to place the filling. 4. Mix the potatoes and chickpeas and place the mix in each of the punctured puris until filled. 5. In a blender, take water, tamarind paste, mint chutney, cumin powder, lemon juice, salt, paper and chat masala and blend. 6. Once the pani is made, fill the shot glass with 3/4 of the pani. 7. Place the filled pani puris on top of the filled shot glasses. 1. After heating up the oil, fry the samosas for 4-6 minutes turning them at regular intervals until thoroughly cooked & golden brown. 2. Let them cool for a few minutes. 3. Place the appetizer plates in an assembly line, add 2 samosas on each plate and add 1/2 spoon of mint chutney on the right corner of the plate and 1/2 spoon of tamarind chutney on the left side of the plate. Cholay Salsa your way to the Dance Floor! 1. Strain all of the liquid from the boiled chickpeas. 2. Once the boiled chickpeas are dried and added to a bowl, add coriander powder, cumin powder, chaat masala, salt, and mix well. 3. Refrigerate the mixture for 10-15 minutes. 4. Take the mixture out and add diced onions, tomatoes and lemon juice. Mix Well. 5. Place the plastic cups in an assembly line and fill 3/4 of each cup with the mixture. 6. Add a few tortilla chips on top of the cup and top it off with cilantro.